Temperatures below freezing can be a cause for concern not only outdoors, but also within the confines of the four walls called home. Generally, when a pipe which feeds a certain fixture such as a shower, sink, or toilet freezes, you will no longer be able to get water through that fixture. This would be the case if the pipe is frozen solid. 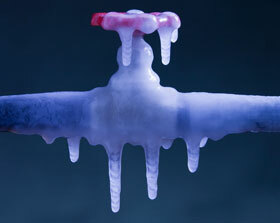 During the winter months, unprotected water pipes and water meters are vulnerable to freezing. This problem may be prevented by making sure that the heat is above 32 degrees Fahrenheit in all basement areas and crawl spaces where pipes and meters are typically located. If a water pipe should freeze, direct hot air from a hair dryer at the section of pipe that is blocked by ice, or apply an electrical heat tape. DO NOT use a torch or other open flame. You can also open ceiling tiles if your home has a drop ceiling, use a heat gun (be extremely careful) or rub the pipes with warm damp rags. Shut-off valves are normally located on either side of the water meter. It's a good idea to operate these valves to keep them functional. Keep the water meter area or pipes exposed to outside walls heated. Provide ventilation to pipes allowing warmer air to circulate around them. Keep some tap water running or at a very slow drip. Leave the thermostat set at 55 degrees or above. Leave the doors open under the sink or other closed areas to circulate warm air. You can turn off your water at the incoming valve before the water meter.